This is my first post on this blog. I'm Coco, Baru and Flan's son, and I'm five months old. I have to study a lot to be a smart hamster like Baru. 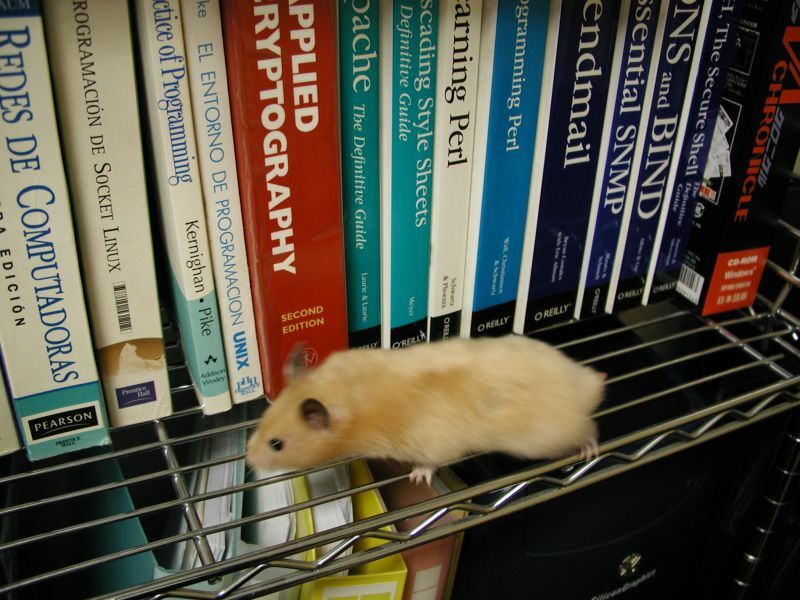 This is why when Papa lets me run free around the room, I climb to the shelves and bite the books. Perhaps if I eat them I will learn all what's written on them, right? PS: Papa is not my real papa. He is Baru and Flan's papa. He is our grandpa (mine and Nana's), but we call that anyway. Um, do you guys live in tokyo? i thought i had read it somewhere, but do they have english books over there? you know, with english print? 1st post is the luckiest!Good post. I bet your Pop Baru can teach you all you need to know, Kid. Well, I suppose I can teach you a few pointers. I mean, we rodents gotta stick together, right? your story is very funny and cute too! your so cute but remember to read the books an not bite em ok if u read em you will b smart!! I don't know how to read so why bother. i like to bite stuffs!